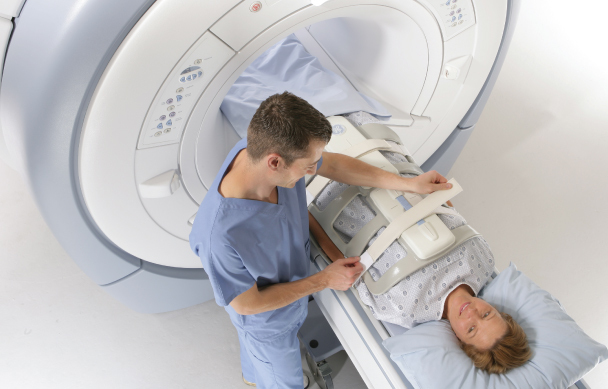 CT scans are a fast, painless way to image soft tissue, bone and blood vessels all at the same time. Computed Tomography (CT) combines computer and x-ray technology to produce multiple images of inside the body. 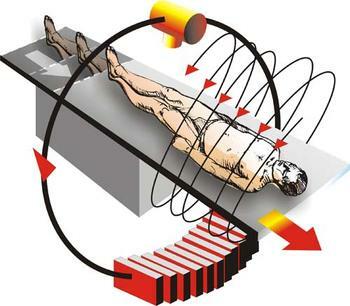 Numerous x-ray beams rotate in a spiral path around the body part being examined, while electronic detectors measure the amount of X-ray radiation being absorbed in the body. These detectors work with a special computer program to generate three dimensional images of the area being examined. The images produced are in a cross-sectional pattern, much like a loaf of bread that has been cut into many small slices. During the exam a technologist will have you lie flat on an examination table. If your doctor requested your exam be performed with contrast, an intravenous line (IV) will be started. Depending upon the part of the body being analyzed, you may be asked to place your hands over your head. The exam table will move quickly through the machine to identify the area to be examined. The table will then move slowly thru the machine to perform the CT scan. You may be asked to hold your breath during the exam. The scan is very quick and is usually completed in about 30 seconds. Wear comfortable, loose-fitting clothing to your exam. You may be given a gown to wear during the scan. Metal objects including jewelry, eyeglasses, dentures and hairpins may affect the CT images and should be left at home or removed prior to your exam. You may also be asked to remove hearing aids and removable dental work. You may be asked not to eat or drink anything for several hours before your scan, especially if a contrast material will be used in your exam. You should inform your physician of any medications you are taking and if you have any allergies, especially to contrast materials. Please bring a list of your current medications: prescriptions, over the counter medications, and vitamins.